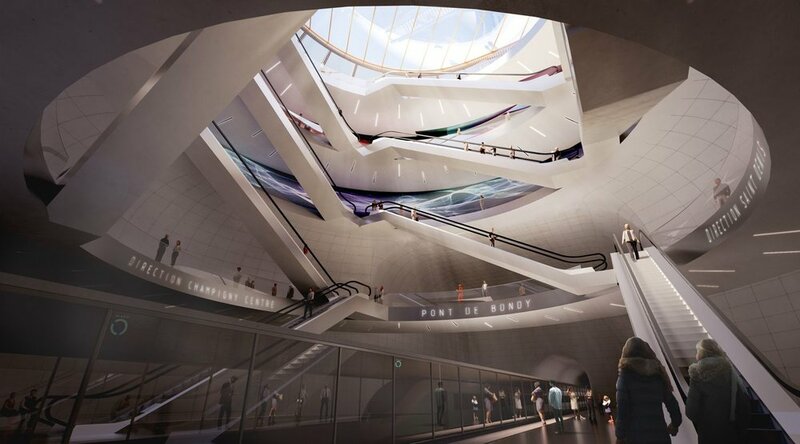 Inserted on the banks of the Canal de l'Ourcq and backed by existing works of art, the project meets the ambitions of an emblematic station and contextual issues: an architectural gesture that connects Noisy-le-Sec, Bondy and Bobigny . The future building takes the form of a ribbon with a variable width of 8.70 meters to 10 meters which allows to cross the canal from Bobigny. It forms a loop along the tracks of the T1 Tramway, then slips under the existing bridges parallel to the canal to Bondy. Thus, it naturally links the different parts of the site, which are very isolated. In the center is a vast circular atrium bathed in natural light, connecting the outside world to the underground world, to the subway platforms. Travelers are accompanied in their journey by an active transition along the ramp, mezzanines and to the docks by mechanical traffic. The movement generated by this architectural gesture as well as the functional organization of the station participate in a staging of the mobility identified as the true thread of the project.